As promised in a past Rug Cleaning Specialist column, I will address the topic of removing fugitive dyes from areas rugs. The principles can be applied to any textile, but we will focus on wool rugs. Despite the fact you test every color in the rug before wet cleaning, sooner or later you will have a surprise. Then what do you do? As all of you have sworn off cleaning specialty rugs on location, you can correct the problem and return the rug to the owner with out a claim. The chart to the left shows the most common bleaches and strippers used to correct stains. Using these chemicals should always be considered a “last resort” solution— and we’re talking fix it or buy it time. Oxidizing bleaches are unstable solutions that contain extra oxygen molecules. These extra molecules are continuously released and seek out and attach to the molecular structure of dyes. By doing so, the dyes are oxidized and chemically changed and can be rendered colorless. Reducing agents (also called strippers) work the opposite of oxidizing bleaches. Oxygen molecules from dye molecular structures are absorbed by reducing agents, causing them to be changed. So, oxidizing bleaches add oxygen to the dye, while strippers take away the oxygen. The result is the same from both chemicals—unwanted color is removed. First, let’s take a look at the bleach part of the list. Hydrogen Peroxide at a 3% solution (the kind you buy for first aid) is a fairly safe agent and can be used for removing many spots that are not always “last resort” situations. Multiple applications are often necessary for complete spot removal. The chemical formula is H2O2; it gives up one oxygen molecule and returns to water leaving no residual. Hydrogen Peroxide can be accelerated by heat and ammonia. Several manufacturers sell a two-part kit of these chemicals for spotting (with the hydrogen peroxide a minimum 10% solution). As you will recall from past columns, anionic acid dyes are used on wool. The high pH of the ammonia plus the peroxide will permanently damage these acid dyes. This type product is best suited for synthetic fibers where is has good results. Chlorine bleach will yellow, weaken and can even dissolve protein fibers (silk and wool) so this material should not be used. I know a few plant cleaners have some for “special” problems, but it is best to never use it on wool rugs. Safer alternatives are discussed below. Of the reducing agents, Sodium Bisulphate is the most commonly used. It has somewhat limited success in removing dye bleed, but is used in coffee stain removers, Haitian cotton cleaners and browning treatment. It is also used to neutralize chlorine bleach. Sodium Hydrosulphite has been the standard fugitive dye remover for years. It is accelerated by heat and seems to work best at 160°F to 170°F and should be kept at this temperature while being used. This can be done by keeping the solution on a hot plate and monitoring the temperature with a thermometer. The product can be applied to the dye bleed area with a Q-Tip or a small paintbrush. Sometime ammonia is added to the solution to loosen the color, which is then stripped by the “hydros.” This process is more an art than science. Anyone who would like to attempt this process should practice on scraps of old carpet before working on a customer’s rug. It is an effective product, but go slowly and take your time. Be certain to rinse all chemical from the rug after dye removal. Then dry the rug flat with an air mover to speed drying. If using Hydrosulphite, be certain the container is airtight and stored in a dry cool place and only dry scoops are used in the product. 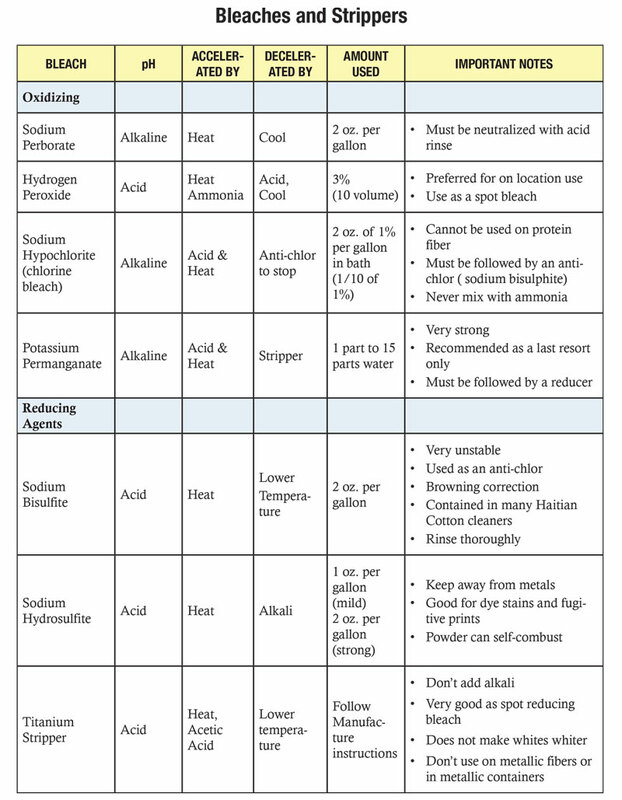 Damp Hydrosulphite can generate heat to the point of spontaneous ignition creating a fire if not immediately controlled. Titanium Stripper is supplied as a dark violet liquid. This product works best on dye bleed from dark colors and stains from berries. It does not cause white fabrics to improve in whiteness. Heat is used to accelerate its action when necessary. You should not use an alkaline material with titanium strippers, as the combination will cause a black stain. Flush the rug thoroughly after dye stain removal and dry the rug flat with an air mover. Strippers, which are blended products, are available under various brand names. A manufacturer may add citric acid or other materials to stabilize the strippers and then sell that product under their house name. Illustration II-IV show how one of these products work. This powdered stripper is mixed in water with glacial acidic acid added. The material is painted on the dye bleed area of the Oriental rug as seen in Illustration II. Heat is used to accelerate the product. Illustration III shows a Jiffy Steamer in use and Illustration IV a Wagner wallpaper steamer being used. Both steamers seem to work well to provide controlled heat to accelerate the stripper. Painting the product on the dye bleed area then applying steam allows the rug specialist to control the process. As this product works in an acid pH environment, there is less likelihood of damage to the wool fibers and removal of the “friendly” dyes. Before attempting to remove dye bleed or other difficult stains, practice on a scrap of carpet. This method seems to be the least demanding of the dye removal processes and produces good, consistent results.